One of the main attractions of San Francisco is our unique Cable cars. San Francisco is the only city in the world that has cable cars running. Hallidie had been born in England and moved to the U.S. in 1852. His father filed the first patent in Great Britain for the manufacture of wire- rope. As a young man, Hallidie found uses for this technology in California's Gold Country. He used the wire-rope when designing and building a suspension bridge across Sacramento's American River. He also found another use for the wire rope when pulling heavy ore cars out of the underground mines on tracks. The technology was in place for pulling cable cars. Children 4 and under ride free. Check Muni's vendor page for locations where passes are sold. NOTE: Transfers from Muni buses and Metro Lines are not accepted on the cable cars. Fares may be subject to change without notice here. 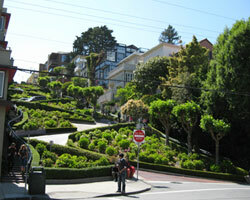 Lombard Street is San Francisco’s most crooked street. The part that is crooked is located at the top of the hill, which happens to have a cable car stop. This is a convenience for tourists that are coming to and from Pier 39. This part of the street has a total of 8 bends- and the street stays the same. It is a one way downhill, so cars must go around in order to go uphill. The pavement is in red bricks, and the street deserves the color	to compliment the flowers and plants that go along the street. There are sidewalks with stairs along the sides of the street, so the tourists can walk up and down to get their pictures. From any part of this area of the street, you can have	a view of Coit Tower, which isn’t too far from here. The reason why this part of the street is crooked is so that the cars can go down the hill with more ease, and to reduce the pressure of braking. The street is designed to go sideways, making it more parallel than perpendicular going down the hill. Although this	takes a longer process of going down the hill, it makes braking more responsive.